FESTIVAL fever has gripped Shoreham today (June 5) as tens of thousands of people flocked to witness the county’s biggest music festival. 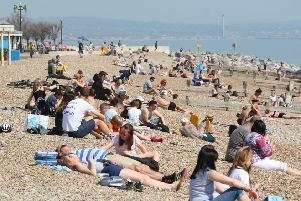 This afternoon has already seen about 30,000 revellers of all ages join the Wild Life Festival at Shoreham Airport, which itself was blessed with stunning summer sunshine. Some of the UK’s top music acts have already taken to the stage to entertain the crowds, with headline artists including Jess Glynne, Mark Ronson and George Ezra. In the next couple of hours, chart-topping group Rudimental, who helped to launch the music festival, will also be taking to the main stage to round off proceedings. So far revellers have been relatively well behaved, a police spokesman at the event said. Although there have been a number of arrests related to suspected drug possession. Police will also be conducting regular patrols on the roads and in the surrounding area in a bid to catch those drink or drug-driving away from the concert. Elsewhere, some revellers have taken to social media to complain about long delays to bus services into the venue. In spite of the reported delays, however, many of those at the festival were having a good time. Gary Steeles, 45, of Upper Shoreham Road, was enjoying the afternoon with his partner Louise Smith. The first day of the festival is expected to close at 2am tomorrow morning, resuming again at 2pm. Tomorrow’s line-up is set to include the likes of Radio One dance DJ legend, Annie Mac, the Wu Tang Clan, Years & Years and Disclosure. On-going noise monitoring is being undertaken by event organisers SJM Concerts just outside the festival grounds. Organisers expect to see about 70,000 people turning out for the two-day spectacular. For full details and travel arrangements for tomorrow, please see the official Wild Life website. Follow our live blog of the festival by clicking here. Get involved using #wildlifefestival on Twitter to send us your photos.